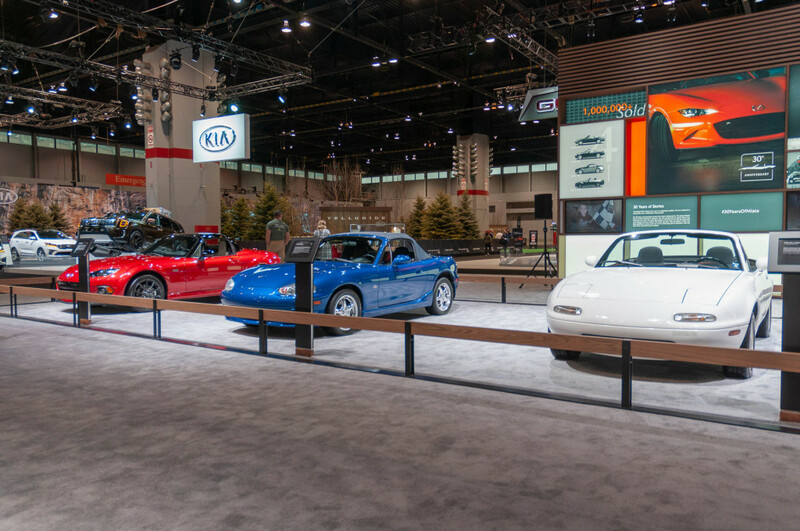 In a twist of fate, the 1989 Chicago Auto Show marked the debuts of the production version of the Mazda Miata and the concept of the Acura NS-X, both with a mission to take on more established sports cars. Inspired by British sports cars of the 1950s through the 1970s, the Miata launched that year as a 1990 model. It had a 1.6-liter engine that made just 116 horsepower, but it proved that power wasn’t needed to create a fun performance car. With Japanese quality, it was also much more reliable than the Triumphs and Lotuses that had preceded it. The Miata has since cycled through NA, NB, NC, and ND generations, and power is now up to 181 horses. Mazda has sold more than 1 million cars worldwide, including some 440,000 in the U.S. Here in Chicago this year, Mazda marked the occasion by unveiling the 30th Anniversary Edition Miata in a brilliant Racing Orange hue. 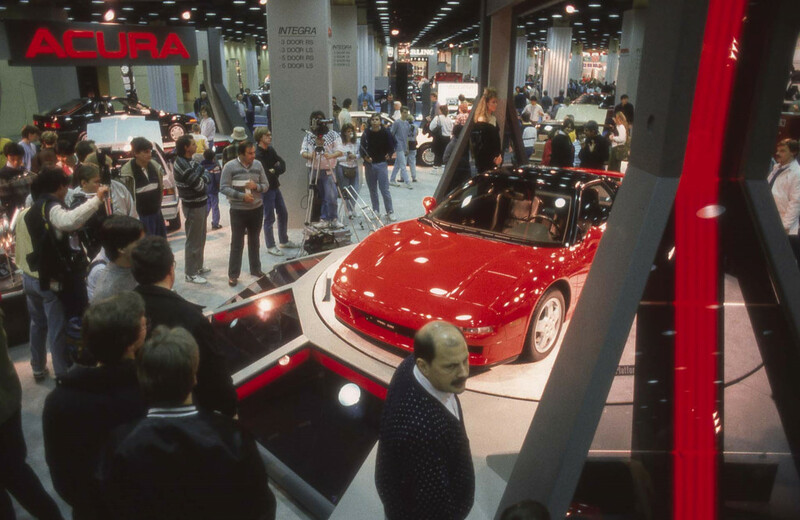 The NS-X hit the Chicago Auto Show on Feb. 9, 1989, as a concept car that previewed the mid-engine, aluminum monocoque supercar that would arrive as a 1991 model. Within the company, the name originally stood for “New Sports car” in an “unknown world” but Acura later changed it to “New Sports eXperimental.” The name was a placeholder for the prototype, but it caught on and the car eventually went to market under the name NSX without the hyphen. The car revealed in Chicago proved to be shorter than the production version, with a shorter wheelbase and shorter front and rear overhangs. Honda’s research and development team spent a month at Japan’s Suzuka circuit developing the car, and recruited legendary Formula One driver Ayrton Senna to evaluate the prototype, who convinced them to make the car more rigid. Testing then moved on to the Nurburgring, which proved Senna was correct. As a result, body rigidity increased by 50 percent. The NSX proved to be a supercar that drivers could live with and it wasn’t finicky like the Ferraris of the day. 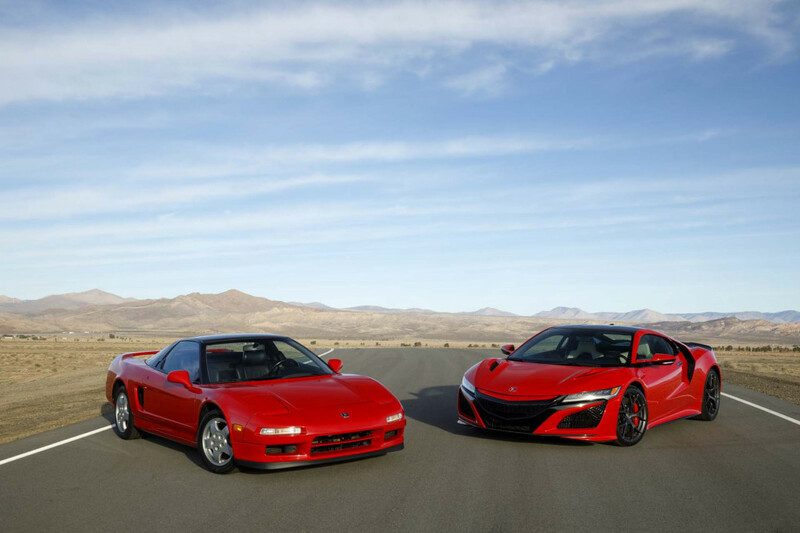 Acura built the NSX from 1991 all the way through 2005. While it started out as true rival for Ferraris and Porsches of the day, it remained largely unchanged while Ferrari cycled through the 328, 348, 360, and 430 and the Porsche 911 evolved through the 964, 993, 996, and all the way to the 997 generations. Acura then revived the NSX for the 2017 model year as a performance-oriented hybrid that produces 573 horsepower and once again takes on the likes of Ferrari and Porsche. The Miata and NSX both came from Japanese brands that decided they could build sporty cars a better way. They both proved to be right, at least for a time, and they both started in Chicago 30 years ago.